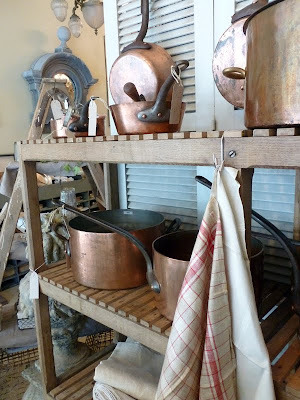 The Drill Hall Emporium: french antiques at cote provence in melbourne and a find for me! 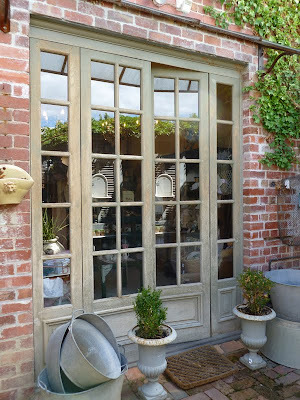 french antiques at cote provence in melbourne and a find for me! I have just returned from a little break in Melbourne and am excited to share some of my images. 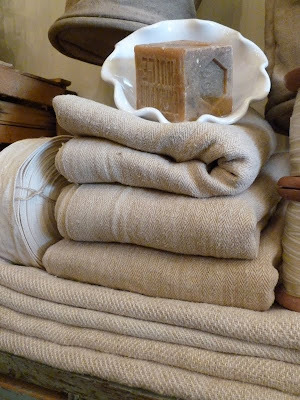 The first few days were filled with deliveries for the store but once I got my work out of the way I decided to find inspiration at one of my favourite stores in Melbourne, Cote Provence (www.coteprovence.com.au). Whilst the shop front of Cote Provence is beautiful, I am actually more in love with the back of the shop, above, with its French doors opening to a brick courtyard. 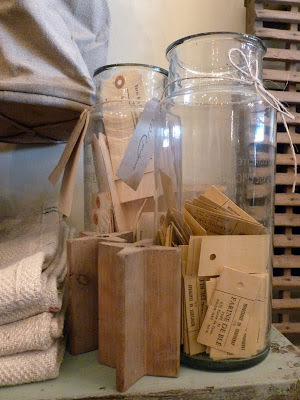 Here is where you will find tin tubs, watering cans, garden pots and the like. Inside the store one can find French copper on shelving, and French grape picking baskets. 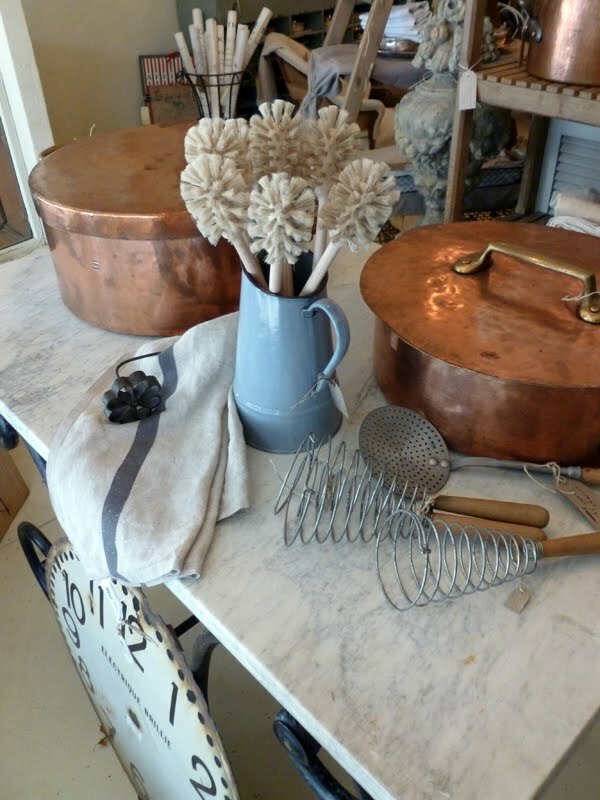 The owners cleverly mix old and new, usually utilitarian objects like these scrubbing brushes, above. More copper to warm the heart. They had some of these gorgeous little silver hotel ware dishes for serving. They seemed quite art deco in style, so they probably date from the 1920s. The silver platter is fantastic, too. 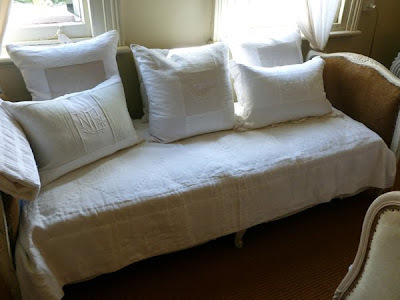 For the linen lover, the upstairs of the shop is filled with embroidered bed linens, both old and new, such as these pillow shams, above. How dreamy! 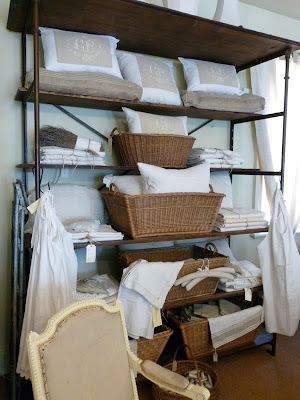 Vintage French shelving (I covet these shelves, terribly, you must know) displaying more French linen. 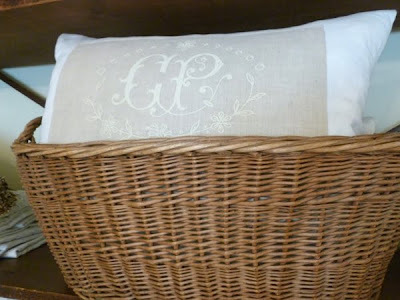 Look at this gorgeous embroidered pillow in the French basket. I almost want to change my name to suit the monogram! 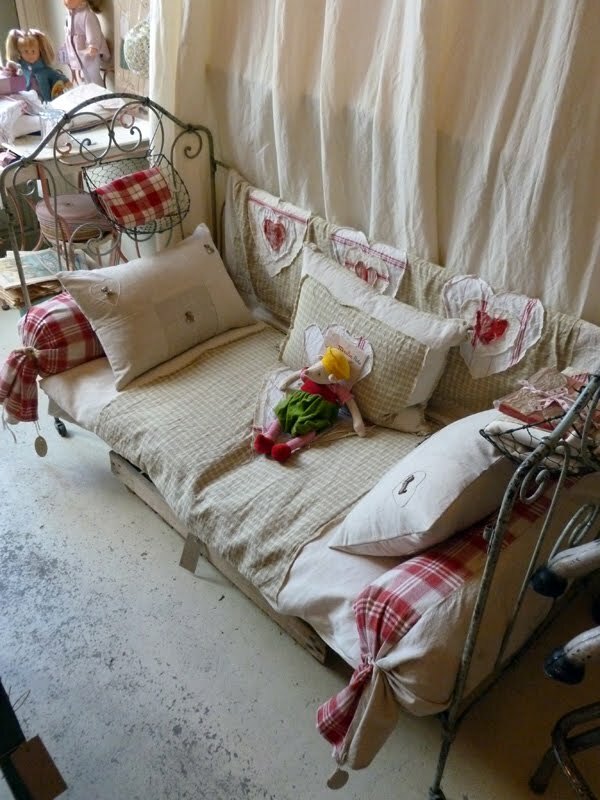 This French iron day bed was downstairs, it is set up to suit a little girl's room. I love the red and beige linens together, and the checked bolster cushions work well against the iron. Pigeon shelves filled with bits and pieces, including classic French enamel street numbers. More rustic linens downstairs, with texture you can see! 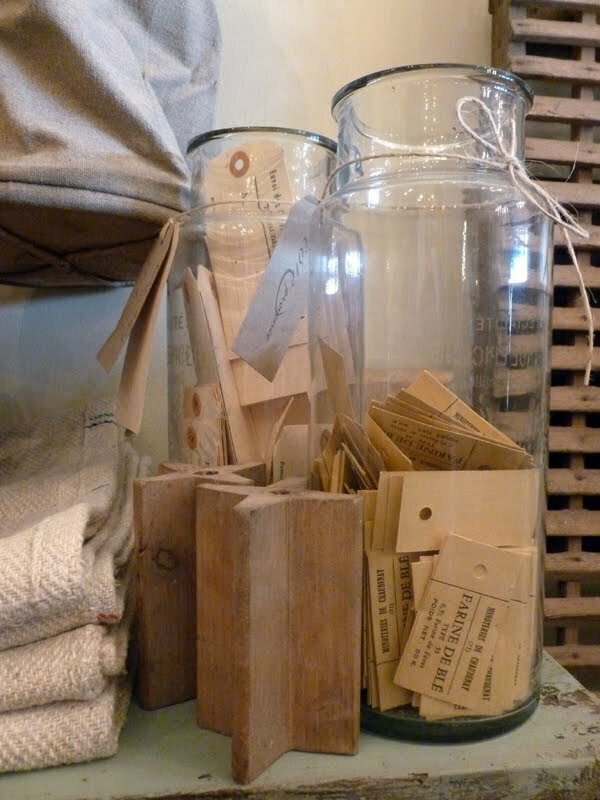 French jars with original old tags inside. 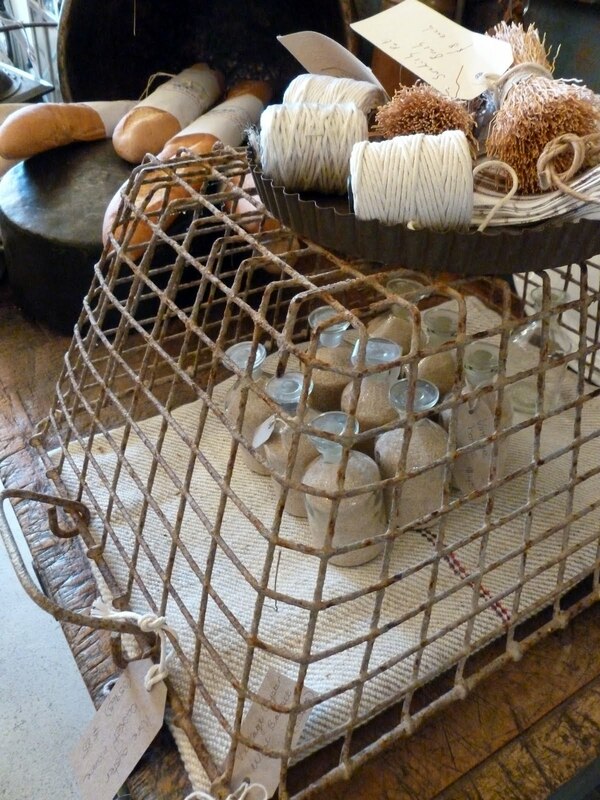 A French oyster basket covering chemist's bottles makes a nice display. 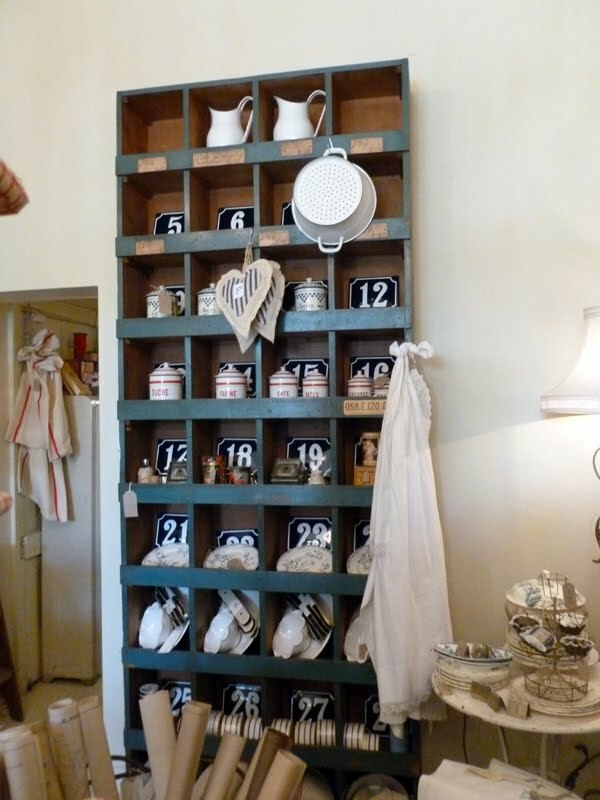 A rack with many vintage French tea towels, these make the perfect gift especially at Christmas time, I think. They also make unique small table cloths or place mats. I adore these blue drawers...a perfect way to store (or lose?) all your bits and pieces. On home soil in Tasmania. I can't wait to use it! Both of the angled roof parts open up and can be propped open for ventilation or for watering, or they can be flipped right over. It also has 2 fold down handles at the other end so that you can pick it up and wheel it around. I feel like a child at Christmas! Can you all see why I am so excited? I can feel your excitement and understand it absolutely! Will have to visit here next time I get to Melbourne! I too only recently discovered this fabulous shop....adore it! I heard they are opening a warehouse soon in Brunswick that will be filled with even more gorgeous treasures! 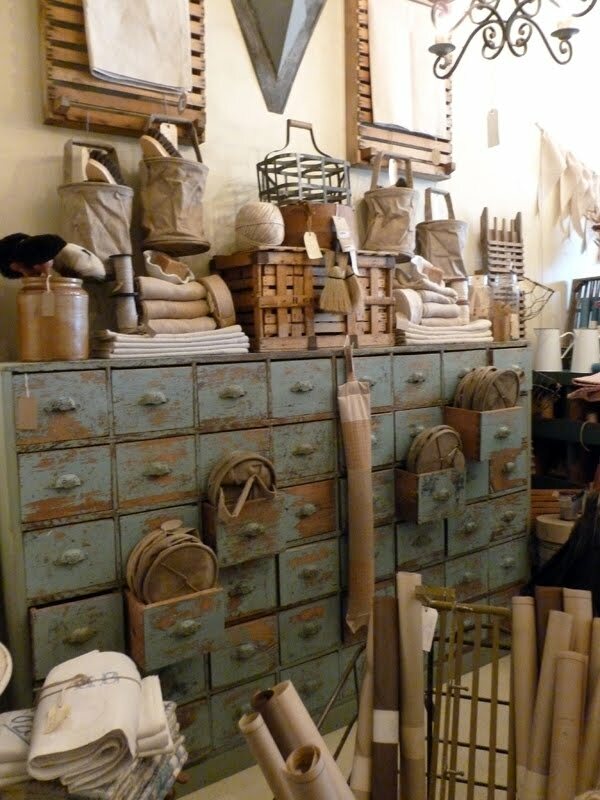 Very nice shop, you are very lucky with this fabulous find! Nice shop! 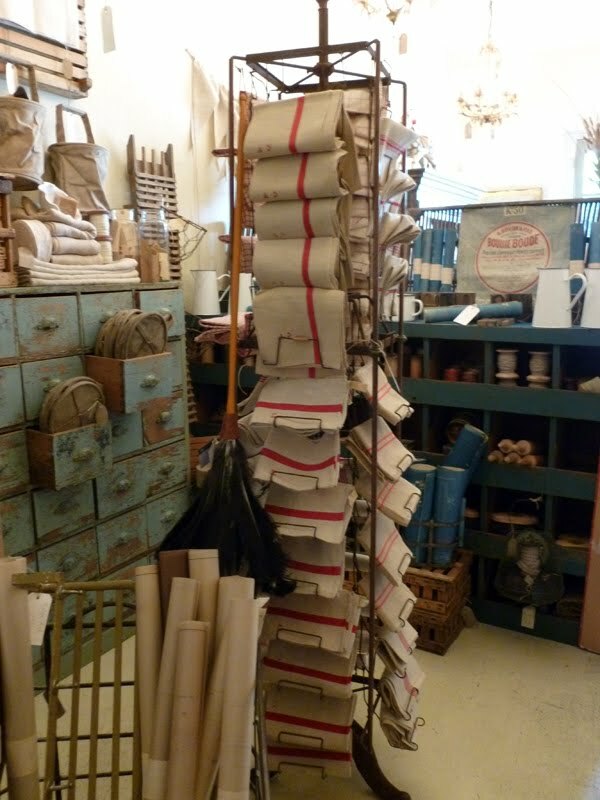 And you have bought lovely things for your own shop, the orchard ladder is stunning! I love vintage things, too. It is not my first time to pay a visit this web page, I am browsing this site daily and obtain fastidious information from here all the time. My name is Fabrice, I saw on your page that your are a french antique lover! I have a society regarding the trade and export of geniune French Antiques. I'm sure that my website will interest you !! 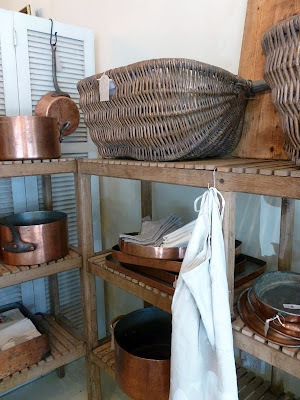 happy browsing on www.thefrenchbrocante.com. I hope to hear from you soon! I had a home for many years in the Luberon region of France, where I became enamored of the light, the food and, of course, the gardens. I now live in Florida, and when renovating, I wanted to bring a bit of Provence into my home and garden. 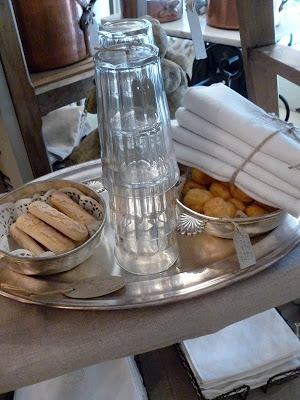 Imagine my joy when I walked into Authentic Provence in West Palm Beach (also online at http://authenticprovence.com). The owners have sourced the most incredible French and Italian garden antiques and products: statues, fountains, planters (note especially the classic Caisse de Versailles, and Anduze pottery), terra cotta shields, stone animals, copper pots, garden spouts, and on and on. They have created an environment that took me right back to many afternoons spent in the beautiful homes and gardens of Provence. They are also very helpful in giving advice and even sourcing special items, and can arrange shipping anywhere in the USA. I highly recommend this business!